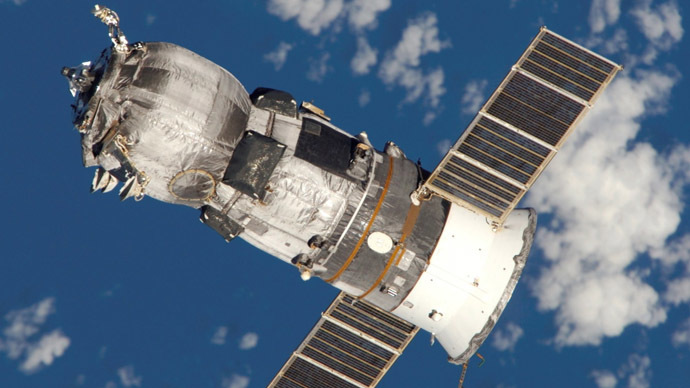 The Russian space agency has confirmed that crippled cargo spacecraft Progress will disintegrate Thursday night or early Friday morning. Most of the craft is expected to burn up in the atmosphere, but small fragments may fall on the surface. Part of their trajectory will reportedly take the fragments above Europe. "The flight path goes above Paris in France, after that near Cologne in Germany, then it goes around Kraków in Poland," RIA Novosti news agency quoted an unnamed source in Roscosmos as saying. "The path also includes Kiev and Kiev region in Ukraine." The parts that may fall to Earth will be small and few, and their size and nature will be "in line with normal cases of Progress-M reentry," Roscosmos said in a statement. The tumbling motion of Progress makes it difficult to predict its flight path, or where and when its remains will touch down. Roscosmos has been narrowing down its forecast as the vessel descends. The latest estimate by the Russian Academy of Sciences has pinned the time down to 2:30 am GMT on Friday May 8, give or take 90 minutes. The assessment has been published on the Academy's Space Research institute's website. However, the European Space Agency (ESA) says it's impossible to narrow the prediction down that much, and its website says the fall will happen anywhere between late Thursday and Friday afternoon. The ESA says more precise estimates are just speculation. Earlier predictions from the US said the debris was most likely to fall in the ocean. The US Air Force's Joint Functional Component Command has placed the probable impact point near the US Pacific coast, and the North American Aerospace Defense Command has said the fragments will fall in the middle of the Atlantic. On April 28, contact with the unmanned Progress craft was partially lost as it went into space. The vessel missed its scheduled orbit and entered an uncontrolled spin. Attempts by ground control to bring the craft back in line for docking with the ISS failed, and it started to descend. Progress was carrying 2.5 tons of supplies for the ISS, including personal mail for the crew and scientific equipment, as well as replaceable parts for the station's life support systems and a stockpile of water and oxygen. Despite the loss of the craft and cargo, the station remains well-stocked. However, earlier ground control advised the crew to use the supplies the have sparingly, just in case. Progress has been used to supply Russian and Soviet space stations, as well as the ISS for the past 37 years. It has proven a reliable vessel, with the latest craft being just the second one lost over the series' whole history.